They needed augmentations for their ship, and waiting on the whims of the woman they wanted to hire didn't set well with the captain or crew of the Black Tide. So instead, Skye D'rath suggested they simply kidnap the woman they needed, and her partner Jaide Calanarre. He assured his captain, and himself, that it would improve Sesame's amiability if she had a friend with her. After all, Jaide was a human, and he had absolutely no interest in a mere human. Jaide would have been shocked at the audacity of Nemesis Spectere and his crew, but she had heard enough rumors surrounding them to know better. Instead, she had to watch as Sesame agreed that they would augment the Black Tide with almost impossible specs - impossible to probably everyone but them. Now, she had to work under the watchful eyes of Skye, and stay out of his way as much as possible. That only added him to the long line of people she wanted to avoid. After all, her brother had created the financial mess she was in, and she had enemies trying to find her. Skye had no problem wanting to protect Jaide, it was having her accept his help where he faced his greatest difficulties. Skye had his own secrets to keep, secrets that put himself and by association, Jaide in jeopardy. If only he could get her compliance, Skye could keep Jaide safe. Only Jaide had a thing about compliance. 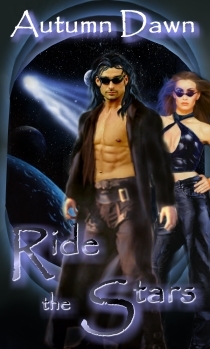 Ride the Stars was yet another thrilling futuristic romance by Autumn Dawn. I was riveted from the beginning. There was action, adventure, betrayal, and romance. I loved the interaction between all of the characters. This proves once again why Autumn Dawn is a "Must Read" author for me.